Spacious 2-room rooftop.Apartment with lots of charm and character, living area 55sqm plus 15sqm roof terrace; tastefully & comfortably equipped for 3 persons. Large living room with spacious, integrated cooking area and directly adjoining 15sqm roof terrace which can be reached through a large glass door. In the living room is a flat screen TV with satellite reception of all free German channels, some French and English channels, a large comfortable corner couch, a large round dining table, chairs. On the terrace is a table, chairs, 2 sun loungers and a parasol. Bedroom in a stylish Ligurian tower with large windows on 3 sides: from the rooms great panoramic view of the sea and mountains with the typical Mediterranean landscape & environment the whole year is green and in the spring of the yellow flowering of mimosa, the white Blossom of the almond trees and cherry trees and the pink blooming of the peach trees is enriched. The king size double bed has an excellent mattress. Bathroom with kl. Window, vanity, shower & toilet; Hallway with stairs. Entire apartment with wooden beam ceilings, comfortable & comfortably furnished. Washing machine is provided in the house. Quiet panoramic location with stunning sea views from the roof terrace, living room and bedroom, in clear weather visibility to the island of Corsica 180km away. The holiday home CASA WITTO is located in a typical Mediterranean environment, characterized by a landscape with traditional terraced mountain hills and evergreen olive groves. The grocery store (including a daily fresh bread and rolls), and a bar with a good restaurant and pizzeria are only 500m away; 100m to the near stop of the city bus with hourly. Connection to the city center of San Remo (15 min. Drive) with its chic restaurants, bars, cafes, boutiques, fashionable shops and shopping centers, ... Combine beautiful, relaxing bathing holidays with an eventful active holiday: soak up the sun on San Remo's beautiful sandy beaches (the most beautiful between Diano Marina & the French Riviera). Borderline) Strolling, jogging, walking, in-line skating, biking and cycling on the "Pista Ciclo-Pedonale", a more than 30km long, directly on the sea leading new fitness promenade, lavishly laid out on the former railway track! - Combining sun & sea with hiking & biking on the romantic coastal hills: exploring the ancient mule tracks & hidden coastal paths of the enchanting historic mountain villages and the fantastic coastal lookouts on the Sea & Sea Alps! San Remo combines cultural diversity with unique tourist excursion possibilities: to the west it is only 20km to the Cote d'Azur with sights such as Monte Carlo, Nice, Antibes, Cannes, ... In the east, the ever-thriving Flower Riviera stretches with the magnificent old coastal & beach resorts such. 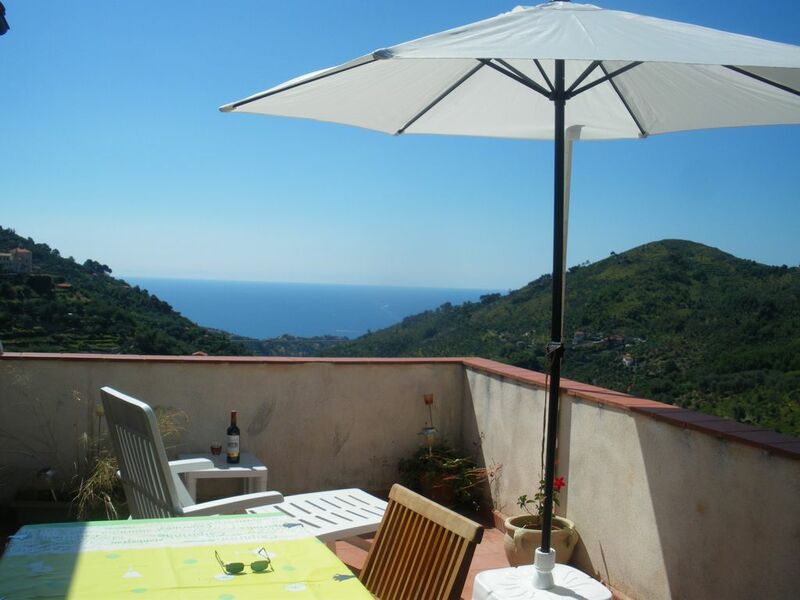 B. Imperia, Diano Marina, Alassio, Cervo, etc ... Everything within reach !! Free internet access via smartphone hotspot. The tenants are free to use 2 new folding bicycles with gear available aufvNachfrage. Their single rent costs € 16 / day in San Remo! CASA WITTO is just above the driveway on which one arrives and shuts down the car without difficulty. From the driveway leads a concrete lane up to the house, which is on foot. The car can easily be parked on the wide driveway that runs below the house, parking is always available. The apartment is located on the 2nd floor, the roof floor. As this is a former farmhouse whose rustic style has been preserved as much as possible during refurbishment, the stairwell has some of the higher levels compared to today. The staircase to the 2nd floor has two half-steps which can be a bit difficult or strenuous for people with walking difficulties or people who are generally not well on foot. These people are discouraged from renting the apartment or recommended to contact the landlord in advance. If you want to observe, photograph or film whales and dolphins up close and personal in the open sea, you can take part in the 3 × weekly, 5-hour boat tours that start in the summer from the old port in San Remo (information there) information booth). All year round, the tours are offered from the port of Porto Maurizio / Imperia. These highly interesting boat tours are accompanied by marine biologists commenting and are a unique natural & adventure experience. If no marine life has been detected, the tour can be repeated for free. Free internet access using a smartphone hotspot. Bathroom with sink, shower and toilet; Washing machine is on the ground floor of the house are available. The apartment has pure south orientation and offers stunning sea views (-at Transparent up to 180km distant island of Corsica!) The living room has a fully equipped, spacious cooking area and direct access with sliding glass doors to the 15sqm roof terrace. The bedroom in the restored Ligurian tower with 3-side windows also provides a herrl. Sea views. The partly left in stone walls give a rustic charm. All rooms have wood-beamed ceiling and were completely renovated in 2010 and modernized. INTERNET: Internet access using smartphone as HOTSPOT. Wunderschöne Wohnung - für die kühlere Periode ungeeignet! Die Wohnung ist wirklich ein Kleinod - die oberste Etage eines wahrscheinlich Jahrhunderte alten Hauses, die sehr geschmackvoll renoviert wurde. Besonders das Schlafzimmer mit Fenstern an drei Seiten und einer ca. 4m hohen Holzdecke ist eine Wucht! Die Ausstattung ist sehr gut - ich habe kein Küchengerät vermißt. Die lt. Beschreibung hinter dem Haus beginnenden Wanderungen sind allerdings nicht zu empfehlen - der anfänglich gut erkennbare Treppenweg endet in Brombeerranken. Wichtig zu wissen ist außerdem, daß für jeden Ausflug man immer ersteinmal 3-5 km auf einer sehr engen und kurvigen Straße aus dem Tal herausfahren muß - nur etwas für routinierte Fahrer, die sich davon nicht streßen lassen. Das entscheidende Manko ist jedoch, daß die Wohnung nicht beheizbar ist. Wir hatten im März mehrere Tage hintereinander 14 Grad im Wohnzimmer! Der von der Vermieterin zur Verfügung gestellte Radiator half kaum. Uns wurde auch deutlich vermittelt, daß Heizen in der Gegend unüblich ist. In der warmen Jahreszeit hat man aber ein wirklich besonderes Domizil, in dem man - auch dank der großen Terrasse mit einer tollen Aussicht - sehr gerne Zeit verbringt. Das Besondere an der Wohnung ist die große Dachterrasse mit schönem Blick auf das Meer und die Berge. Wir haben den Aufenthalt sehr genossen. Die Wohnung ist schön, geräumig, gut ausgestattet und sehr sauber. Der Blick von Dachterrasse & Wohnung ist einfach fantastisch! Myriam hat viele gute Tipps und ist überhaupt unglaublich hilfsbereit & zuvorkommend; mille grazie ! Insgesamt ein wunderbarer Aufenthalt der unbedingt zum Wiederkommen lockt. Fernab vom Standard-Tourismus befindet sich die Ferienwohnung ca. 7km vom Stadtzentrum erhöht in einem Stadtteil Sanremo's. In einem schönen alten italienischen Häuschen genossen wir die ruhige Umgebung und den tollen Ausblick auf das Meer. Die Ferienwohnung lädt zum Verweilen ein, aber auch als Startpunkt für Ausflüge in die Umgebung. Die liebe Gastgeberin steht für Tipps zu Ausflügen, schönen Stränden, Einkaufsmöglichkeiten etc. zur Verfügung. Wir könnten uns sehr gut erholen und kommen gerne wieder! Obwohl sehr kurzfristig hat unsere Buchung problemlos geklappt und die sehr freundliche Vermieterin stand immer für unsere Fragen zur Verfügung. Die Wohnung ist bestens ausgestattet und in Top-Zustand. Alles ist genauso, wie beschrieben und auf den Fotos zu sehen. Ein idealer Ausgangspunkt, um ausser zu Baden die Blumen-Riviera oder die Cote d'Azur zu erkunden! Die herrliche Dachterrasse mit dem tollen Blick haben wir leider viel zu wenig genutzt, da wir viel unterwegs waren. Alles in allem ein wunderbarer, aber viel zu kurzer Aufenthalt. Wir kommen wieder, dann aber für eine längere Zeit ! Grazie mille, Myriam! Die Dachwohnung war ein tolles Erlebnis! Eine große Terrasse mit fantastischem Blick: Rundherum Berge, vorne ganz groß das Meer und steil unten das ganze Tal! Wahrscheinlich einer der besten Aussichtspunkte der Gegend! Und so gelegen, dass keiner reinschauen kann! Da haben wir die meiste Zeit verbracht! Schlafzimmer, wie ein Turm mit Blick auf 3 Seiten! Wohnzimmer mit Küche auch gut ausgestattet, Badezimmer klein aber fein… Eine wirklich außergewöhnlich schöne Ferienwohnung, absolut weiter zu empfehlen! CASA WITTO is the former. House of Ligurian flower farmers, located in a quiet area in a small suburb of San Remo. The house in a unique panoramic position has a lot of charm and has a magnificent sea view: with a clear view, the view extends to the island of Corsica 180km away! ; to the sea are just under 5km. An ideal location for wonderful excursions: - Either in an easterly direction along the Riviera of Flowers with picturesque and picturesque coastal places such as Porto Maurizio, Diano Marina, Alassio, Cervo ... all less than 1 hour by car! - Or to the west, where the world-famous Cote d'Azur is only 18km away, so practically on the doorstep: world famous places like Monte Carlo, Nice, Antibes, Cannes ... etc. are only 30-60k away & easy to reach via highway! There are many wonderful discoveries waiting for nature and hiking enthusiasts, which can be tackled directly from the house of CASA WITTO: - Hiking or biking along the coastal heights along old paths and mule trails, through old olive groves with varied, bewitching fragrant Mediterranean flora and ever new views of wide mountain valleys and old romantic coastal & mountain villages. And here is always to have the azure Mediterranean Sea views & close at hand! Do not miss: - An excursion to SanRemos mountain, the Monte Bignone, whose 1300m peak is only a 1h walk from CASA WITTO, and from which the view to the west extends over the coast & sea to St. Tropez, in the south the infinite blue of the sea with the 180km distant Corsica beguiles the senses and in the north the marvelous, 3200m high sea-Alps admire marveling! Golf: San Remo has a wonderful 18-hole golf course that is playable all year round. Designed by English architects and created between ancient olive trees, the course has a spectacular view of the Mediterranean Sea and the entire coast of the Cote d'Azur! Ski: Magnificent ski slopes are found from December through April into lime, one of the largest ski areas in the Piedmont Alps. The ski resort of San Remo and the sea only 60km and is within an hour's drive. Over breakfast the sailors and large luxury cruisers in the azure expanse of the Mediterranean, then experience the full ski fun in the nearby lake-Alps, and still enjoy a stroll and a delicious meal by the sea in the evening - San Remo has it all ! BITTE BEACHTEN: - Die im Inserat gelisteten Mietpreise gelten für eine Belegung mit 2 Personen ! - Bei einer Belegung mit 3 Personen gilt ein Zuschlag von € 10 pro Nacht ! - Die Nebenkosten für Wäsche/Gas/Strom/Wasser sind im Mietpreis enthalten. Wäsche inklusive besteht aus: 1 Satz Bettwäsche, 1 Satz Handtücher, Tischwäsche. Wegen des Wäsche-Wechsels während der Mietzeit bekümmern sich die Mieter selbst, eine Waschmaschine steht zur Verfügung. - Die Kaution beträgt € 150 und wird nach Mietende erstattet. - Für die Endreinigung, falls diese vom Vermieter übernommen wird, fällt eine Kosten-Pauschale von € 50 an. PLEASE TAKE INTO ACCOUNT: : - Prices listed are valid for an occupancy of 2 people ! In case of an occupancy of 3 people the rent increases by € 10 per night - Charges (laundry/electricity/gaz/water) are included. Laundry included consist of: 1 set of bedlinen, 1 set of towels, table linen. The tenant worries themselves about laundry change during renting; a washing machine is available. - The security deposit amounts to € 150 and is refunded after end of renting. - The final cleaning & clearing, if not done by the tenant, costs € 50. PRENDRE EN CONSIDERATION SVP: - Les loyers indiqués valent pour une occupation avec 2 personnes; lors d'une occupation avec 3 personnes une majoration de € 10 par nuit est en vigueur - Les charges (pour linge/gaz/électricité/l'eau) sont inclus. Linge compris: 1 jeu linge de lit, 1 jeu de serviettes, linge de table. Les locataires eux-mêmes s'occupent pour les evenuelles changements de linge pendant la location. Une machine à laver est disponible aux locataires. - La caution s'élève à € 150 et est remboursée après la location. - Si le nettoyage final est entrepris par le propriétaire, le locataire se charge des frais de € 50.